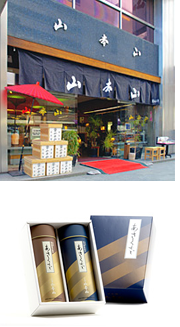 Yamamotoyama traces its beginning back to 1690 when our founder, Kahei Yamamoto, a tea merchant in Kyoto, moved to the Nihonbashi district in central Edo (now Tokyo), an area that was starting to flourish as more and more merchants set up shop. In 1835 the sixth Kahei Yamamoto began producing a high-quality green tea called “Gyokuro”, made from only the very youngest new tea leaves grown on his own plantation. In 1947 Yamamotoyama introduced its line of nori seaweed products.